On this day we would like to say a special thanks to some true American Hero’s. Thank you to our Veterans! Thank you to the men and woman who have served in the Armed Forces and the sacrifices that both you and your families have made to protect out freedoms. Thank you to those that are presently fighting abroad. There are never enough things that can be said for the appreciation that we can bestow upon all of your for your sacrifice and duty to the United States. So often we take the past and present service of our brave men and women of the Armed Forces for granted. Know, that these individuals fight for peace, fight for freedom and fight for the very liberties that you an I enjoy every day. The next time you see a Veteran, please than them. 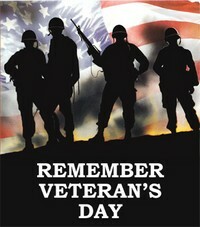 Thanks for their service should never be relegated to just one day out of the year. 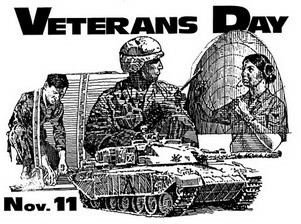 Michelle Malkin has a nice write up and we would be remiss if we did not provide links to the must read Veterans Day tributes from Milbloggers on this day. Also a fantastic article from Black Five … It’s About the Living. Part I here. Thank you to all that serve and served to protect our freedoms. Thanks to all fellow veterans out there for a job well done! God bless our brave men and women currently serving in our military to protect our country and all of the freedoms we enjoy daily, but so often take for granted!! thanks to our military for keeping us safe. We will always remember the sacrifices made by our armed forces to keep our country and our freedoms safe. A huge thanks to our Men and Women who keep us safe and free. Thanks Scared Monkeys for recognizing these heroes! We remember that the price of our Freedom is never really free! To ALL of our Veterans, present past & future we give you thanks and great praise for the protection and service you give unshelfishly to your Country. U.S. VETERANS = PROUD TO BE AMERICAN, BABY!!!!!! 5 liz…wow. You brought me a tear, and I am not easy to that. I was a pointman, for both infantry and long patrols. We were used so much it was inhumane. Though my type were volunteers, it took two years of toughman schools to get a front row seat. We expected of ourselves — to shine. In the arrogance of this statement I do have a story. Shifting gears some. A former Marine who served in Afgansistan, serviced my heating and airconditioning units this past month. I told him, “I predict you have stories. I will try to share the experience with you best I can by listening to each thing you have to say, doing my best to be attentitive and mouth shut.” Got a tear out of that tough Marine. I told him, “I am a proud veteran, and other veterans or those who appreciate veterans (fully equal) — we are a fantastically bonded club.” Not lip service – those that care. Thanks to all those that give unselfishly for our freedoms.